Teachers across the U.S. participate in the first National Sustainability Teachers' Academy at Arizona State University in Tempe, AZ. Kamehameha Schools teachers Rod Floro and Brendan Courtot hope to empower Hawai’i’s youth through culture and sustainability. 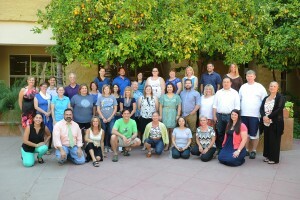 Floro, a sixth-grade science teacher, and Courtot, a vocational technology and applied math teacher, were selected through a competitive application process to participate in the first ever National Sustainability Teachers’ Academy in June 2015 at Arizona State University in Tempe, Arizona. The Teachers’ Academy was established through the generosity of the Rob and Melani Walton Sustainability Solutions Initiatives. Rod Floro, sixth-grade science teacher for Kamehameha Schools , presents ideas for a sustainability curriculum. The National Sustainability Teachers’ Academy equips passionate kindergarten through 12th-grade educators like Floro and Courtot with the knowledge and skills to inspire and motivate future leaders to create and implement solutions for the economic, social and environmental challenges of our world. The solutions-based curriculum emphasizes real-world learning by integrating knowledge with practice and capitalizing on the cutting-edge research made available to the Teachers’ Academy by ASU. Brendan Courtot, vocational technology and applied math teacher for Kamehameha Schools, talks about limited island resources . Erin Redman, Teachers’ Academy program manager, believes teachers shape the future through the way they behave and the way they teach. Floro and Courtot plan to be sustainability role models and inspire students to be change agents. 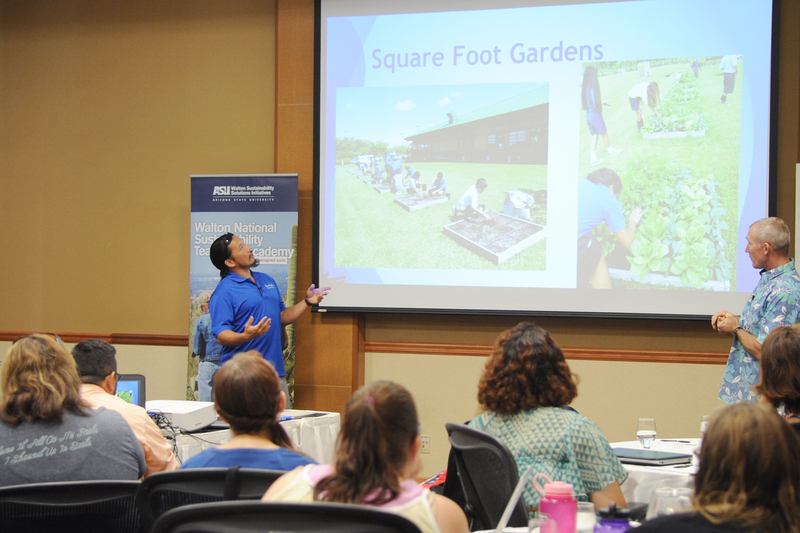 As part of the workshop at ASU, they created a Sustainability Action Plan for the Kamehameha Schools Hawai'i campus that incorporates sustainability principles while embracing cultural values. Curriculum will be developed around a campus-wide systems approach, including food, nutrient recycling and Hawaiian culture. 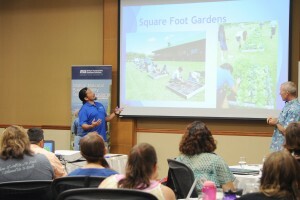 Ideas include expanding the mala (garden), improving the bokashi composting center and reconnecting students to their natural environment through Hawaiian language and cultural excursions. When presenting their action plan to fellow Teachers' Academy participants, Floro used the voyaging canoe example to express the importance of rooting cultural values in teaching sustainability. “He wa`a he moku, he moku he wa`a. Our canoe is an island and our island is a canoe," he says. "Hawai’i is really limited by the availability of resources. We need to be conscious of our inputs and our outputs. Where do we get our inputs from and where are our outputs going? Whether we voyage on our canoe for 9 hours, 9 days or 9 generations, we need to take these things into consideration." 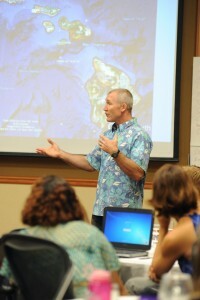 Courtot shared some key challenges faced by the island of Hawai'i. Through the knowledge and skills gained during the intensive in-person workshop and the support through the online course, Floro and Courtot are equipped with the tools to successfully implement their Sustainability Action Plan at Kamehameha Schools, implement a sustainability lesson in their classroom and train additional teachers in sustainability education. The teachers have one year from the start of the program to complete their project. Please join us in wishing them much success and sharing the impact of their project in a year’s time. Become a sustainability education pioneer. Applications for upcoming National Sustainability Teachers’ Academy workshops will be available in January 2016. More details can be found here. Kamehameha Schools is a private, educational, charitable trust founded and endowed by the legacy of Princess Bernice Pauahi Bishop. Kamehameha Schools operates a statewide educational system enrolling nearly 7,000 students of Native Hawaiian ancestry at K-12 campuses on O`ahu, Maui and Hawai`i and 30 preschools statewide. More than 41,000 additional learners and their caregivers are served each year through a range of other Kamehameha Schools outreach programs, community collaborations and financial aid opportunities. Income generated from its endowment portfolio of Hawai`i commercial real estate and other diverse investments funds more than 96 percent of Kamehameha’s educational mission. More information can be found here.